Located on the border of Carmel and Carmel Valley, this is a modern, non-denominational church with old world charm. Few churches in the area allow an outside pastor or officiant to bring in a wedding party that is not a member of the church, but they have been wonderful to work with. They have a large sanctuary area (with pews for seating) as well as a smaller room for weddings with 20 or fewer people. Rental fees are required but considered a donation. For photos, there is a lovely rose garden as well as a forested area with large lawns. 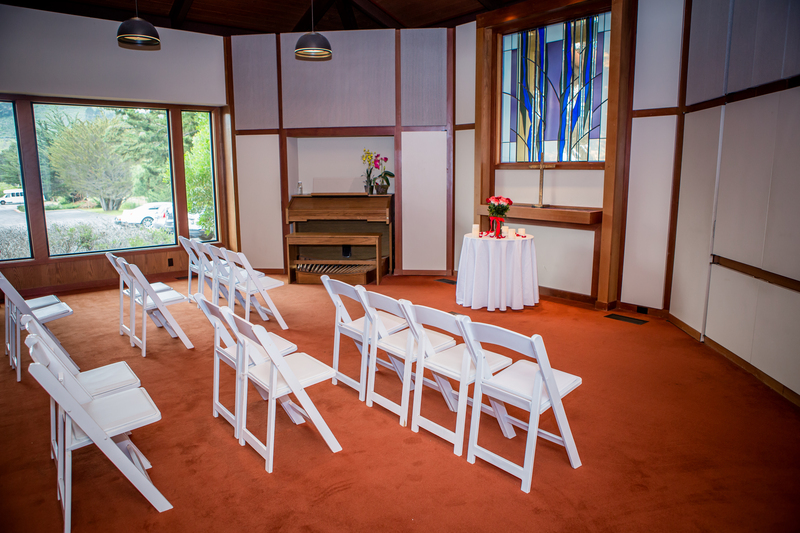 Located in Monterey with easy access to Highway 1, their sanctuary has seating for up to 100 guests. There is also a kitchen suitable for serving catered meals and an area that works well for buffet services. Rental rates vary but start at about $250 for a smaller, fireplace room and $500 and up for the main sanctuary. A beautiful building in the quaint town of Pacific Grove. Close to the ocean, downtown restaurants and just a third of a mile from Lovers Point and Berwick Park. They allow for outside caterers and include a small kitchen and staging area. For the main sanctuary, there is a bride's "ready room" and restroom. Outside, there is a lovely garden that can be used for photos.